Voice For The Voiceless: Ernie Freeman- Your Breedism Shows. Ernie Freeman- Your Breedism Shows. 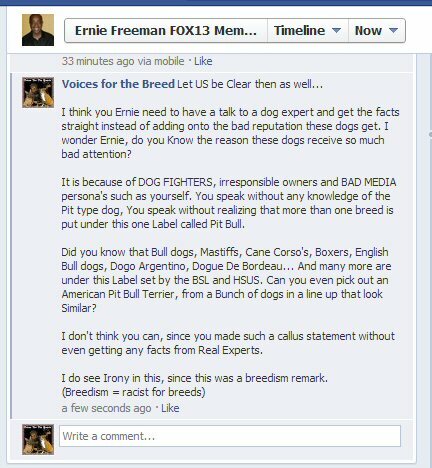 Ernie Freeman of FOX13 Memphis TN News Station, Made a racist (breedism) comment about our Bully Breed dogs. Now with everything that has been happening with our Breeds, I think we all know this kind of slander from the Anchor Persona's Such as Ernie is not warranted nor is it acceptable. This is the kind of slander I am talking about when it pertains to Bad Media. 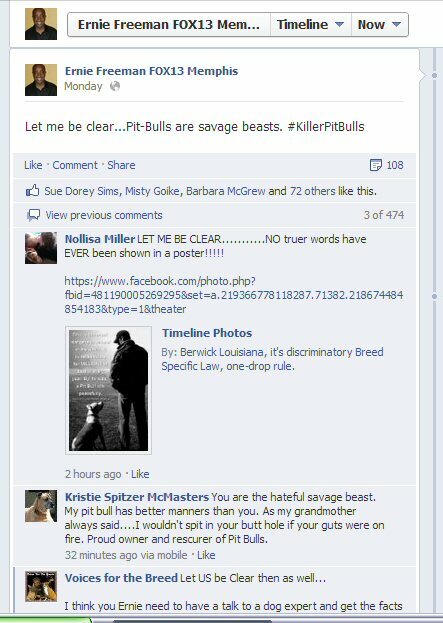 Followers, Supporters, Friends and Pit Bull Type Dog Moms & Dads, I think it's high time we take a stand against people like Ernie Freeman, who sully's our bully breeds reputation. Ernie speaks without knowledge of the Bull Breed, he speaks without truth without any factual or expert opinion to back his statements up. What he stated can be shown below, these kind of statements are CALLUS and NON-FACTUAL. Ernie, I can say so much in a short paragraph about the color of your skin. However, since I have no callus or cold heart towards the color of a person, I will refrain from saying it. Because unlike you I see only one race when it comes to people, and that is the HUMAN RACE and I see dogs as a Variety of breeds of choices we as those Humans have made Eugenically. Without us the HUMANS, dogs would not exist as the FAMILY PET. They would be mere Wolves still. Point being is this, you are being ignorant toward a dog breed that one of your forefathers created or had and hand in creating, is total disrespect to a creation that has taken over a 1,000+ years to create. Truthfully it is the worlds longest Eugenics project, and it will continue until Humans no longer exist. So Until that day comes were we are no longer valuable or needed in the hand of creation. I say drop your ignorance and bigotry. My statement still stands here, I would like to know if you can pick out an American Pit Bull Terrier, from a line up. To prove that you actually know what a Apbt looks like. Guarantee you really don't know the difference.